To give young people a voice. To provide them with a platform on which they can present, discuss and transport their topics and concerns. To open up the ways on which they can make use of their right to participate - these are the aims of the newspaper projects of FUTURE VOICE. The magazine for the World Girls Day, Berlin-Mitte is here! Since then, many supporters around the world, in more than 70 countries, are organizing actions to raise awareness of the rights of girls and women. Together they want to achieve a true equality of girls and women, because millions of girls and women in the world still cannot live a self-determined life - and that must change. The AG Girls* and young Women* in Berlin Mitte are organizing a World Girls Day since 2012, which took place again in 2018 at the Olof-Palme-Zentrum, Berlin Mitte. Our young reporters were with you and for you on the spot and they have checked out the event. They researched, documented, asked for interviews and photographed. In our magazine you will find an overview of what was going on the World Girls Day, Berlin-Mitte 2018. Newspaper projects at the Wilhelm-Hauff Primary School in Berlin Wedding. Creation of a new student magazine at the Willy-Brandt-Schule in Berlin-Wedding. We are pleased to be able to initiate the foundation and development of the student newspaper BRANDT NEWS at the Willy-Brandt-School, Berlin-Wedding. With the fourth edition, we now hand over the baby to the expert hands of the school and students. 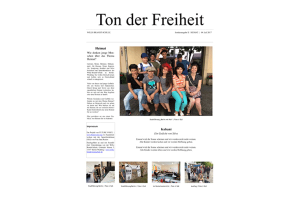 Newspaper project together with young refugees. 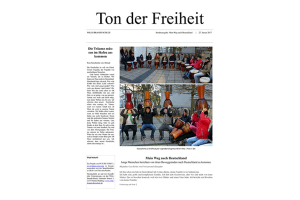 The students of several language learning classes give their voices in our newspaper project TON DER FREIHEIT power and reach. Most of the participants are young refugees from Syria, Iraq and Afghanistan. Their topics, stories and perspectives on their new life in Germany as well on their homelands create this special format.